Color us all kinds of intrigued about this Bachelor Nation news: Former Bachelor contestant Vanessa Grimaldi is reportedly dating again. The news comes about a year after her engagement to Bachelor star Nick Viall was broken off, and it also comes shrouded in a lot of mystery. Let’s break down what we know about Grimaldi’s big news so far. Grimaldi didn’t comment or offer up any hints on the person she’s dating. Unfortunately, that wall of silence on the identity of her new beau also extends to her Instagram page (where you might expect to see a confirmation) for the most part. There was, however, a single, very interesting post to her Instagram Story on Tuesday, Jan. 22, that has us wondering if the man Us Weekly alleges she’s dating, Canadian businessman Josh Wolfe, is the man seen in the eyebrow-raising post. Despite Grimaldi not naming the person she is dating, Us Weekly claims that she is dating Wolfe. Since Grimaldi is staying mum on details, Us Weekly can’t confirm how exactly Grimaldi and Wolfe met nor did they explain why it is believed to be Wolfe. 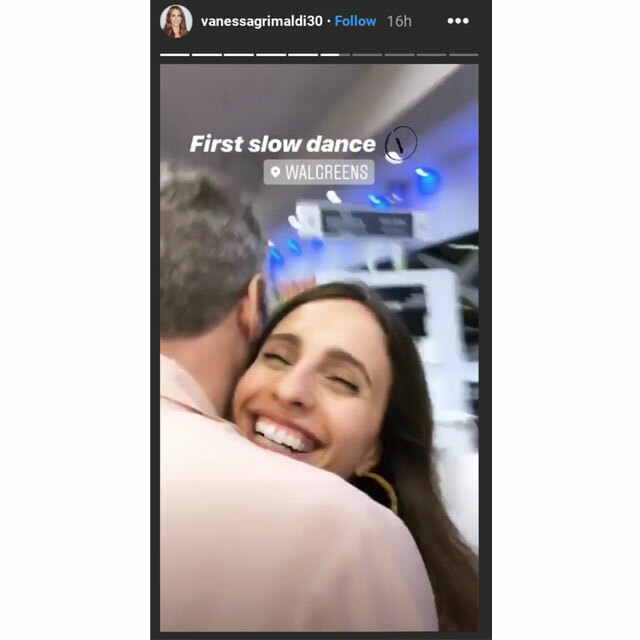 However, we find it interesting that Grimaldi posted a video on Jan. 22 showing her and a guy with salt-and-pepper hair dancing in a Miami Walgreens, with the video captioned “First slow dance.” The hair color is strikingly similar to photos of Wolfe and his hair, as seen in a Hollywood Gossip article on Grimaldi’s alleged relationship with him. There’s no confirmation it’s him in Grimaldi’s Instagram Story, but it makes you wonder. For now, though, we’ll have to wait for Grimaldi to come forward and confirm whether or not she and Wolfe are an item. We’re just happy that she seems happy. Perhaps she’ll give her fans official details on her exciting new relationship soon.